Road Atlanta is one of the more high-speed, old-school venues on the Tudor United SportsCar calendar and as such, when the track bites you, it bites hard. That and folks just couldn't quite figure out how to make a safe exit from pit lane. Attrition was the name of the game, so here are some of the larger incidents from yesterday's race. 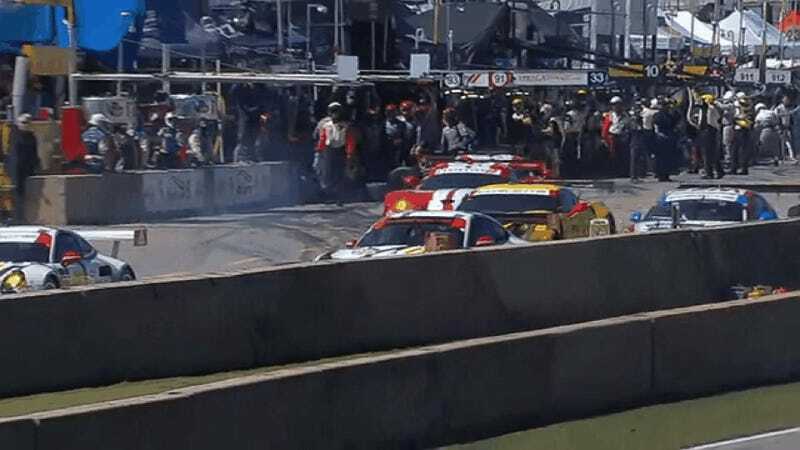 Pictured above is a pileup of GTLM cars from inside pit lane from hour 3 of the race. The number 62 Risi Competizione Ferrari, number 911 Porsche 911 RSR and number 3 Corvette C7.R were all damaged in the mix-up. While it is pretty common for drivers to fiddle with belts, hoses, and other driver equipment as they drive slowly out of pit lane, releasing these three cars at once was a mistake. No one was paying complete attention to what was in front of them. Oops. Mid-way through the race, everyone's favorite phallic vehicle was involved in contact as well, forcing Gustavo Yacaman's OAK Racing P2 Ligier-Honda into the barriers outside turn 1. Turns out, the Delta Wing is not immune from contact by sheer will of wackiness. A move from the Delta Wing sent Yacaman's car speeding off-track, but thankfully, Yacaman was not injured in the shunt. Finally, the biggest hit happened to Spencer Pumpelly in the number 45 Flying Lizard Motorsports Audi R8 LMS during the eighth hour of the race. Pumpelly and the number 45 car have had a miserable weekend, starting off with a penalty for contact with the number 90 Spirit of Racing Corvette DP early on in the race. Thankfully, Pumpelly is fine despite the large hit. He lost control of the car's rear when taking the turn (UPDATE: it was a blown left rear tire that caused it to go out of control), got onto the loose "marbles" at the edge of the track, and caused significant damage to both his car as well as the barrier. It did, however, cause the twelfth yellow flag of the race directly after the restart from another yellow flag. Pumpelly's caution flag came right after contact between Markus Patalla in the number 94 Turner Motorsport BMW Z4 GT3 and Memo Rojas in the number 01 Chip Ganassi Riley-Ford DP at turn 10. This collected both Patrick Pilet in the 912 Porsche 911 RSR and Michael Valiate in the number 90 Spirit of Racing DP. Both cars spun around backwards on impact. Did I mention attrition being a factor? It takes a lot of skill, concentration and luck to make it through ten hours straight of racing unscathed.